Bullpen catcher Javier Bracamonte won over fans in Kansas City Wednesday night. KANSAS CITY, MO -- Even in the face of disappointing defeat, the Houston Astros are showing their true colors as good sports and role models. While the Astros lost to the Kansas City Royals 7-2 at Kauffman Stadium last night, dashing their hopes for a World Series run, bullpen catcher Javier Bracamonte won over fans with his actions after the game. Bracamonte was spotted tossing gear to kids in the stands and wishing the Royals good luck in the World Series. Royals fan David Dahmer was so impressed by Bracamonte's actions that he posted several photos to social media. "Last night Javier Brackamonte #85, a Houston Astros bullpen catcher showed an unbelievable act of class and sportsmanship," Dahmer wrote. "After the game was over, he dug in his giant bag of gear and basically emptied it throwing stuff to all the kids. He threw them his hat, batting gloves, his chest protector, his chin guards, tootsie pops and every baseball he could find which was about 25 balls.. When he was done he threw his bag over his shoulder, clapped for all of us and wished us good luck the rest of the way. It was so cool to see someone showing kids how it's supposed to be done. I was sitting there just shocked. After getting heckled all night he showed us what he is all about.. What a great guy. I'll definitely be rooting for him from now on." 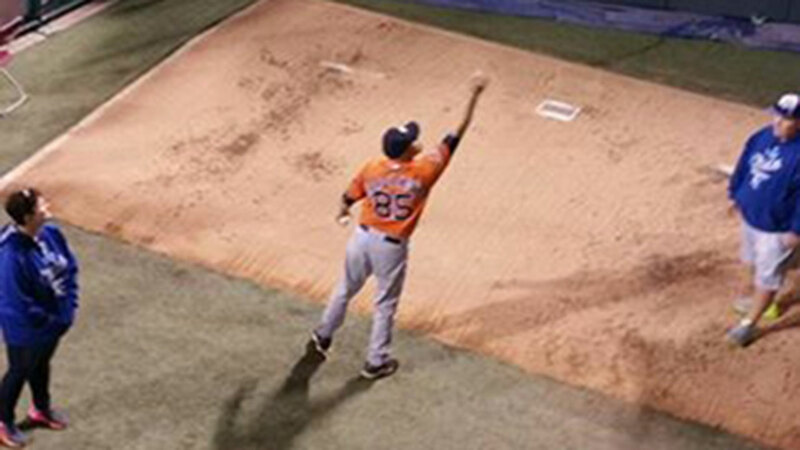 Astros bullpen catcher Javier Bracamonte tosses some goodies to kids following his team's season-ending loss to the Royals. This isn't the first time Bracamonte has been recognized for his good sportsmanship. Earlier in the ALDS, another fan tweeted, "Pretty awesome that you played catch with some kids cheering for the royals before the game." Bracamonte joined the Astros in 2001. Born in Caracas, Venezuela, he now lives in Houston with his kids.